Canna (Canna X. ): growing, planting, caring. Banana-like leaves and showy flowers all summer long! Scientific name : Canna X.
Canna - Canna or Canna lily, not a true lily - is a genus of 10 species of flowering plants. Although a plant of the tropics, most cultivars have been developed in temperate climates and are easy to grow in most countries of the world as long as they receive at least 6–8 hours average sunlight during the summer, and are moved to a warm location for the winter. Cannas grow best in full sun with moderate water in well-drained rich or sandy soil. They grow from perennial rhizomes, but are frequently grown as annuals in temperate zones for an exotic or tropical look in the garden. 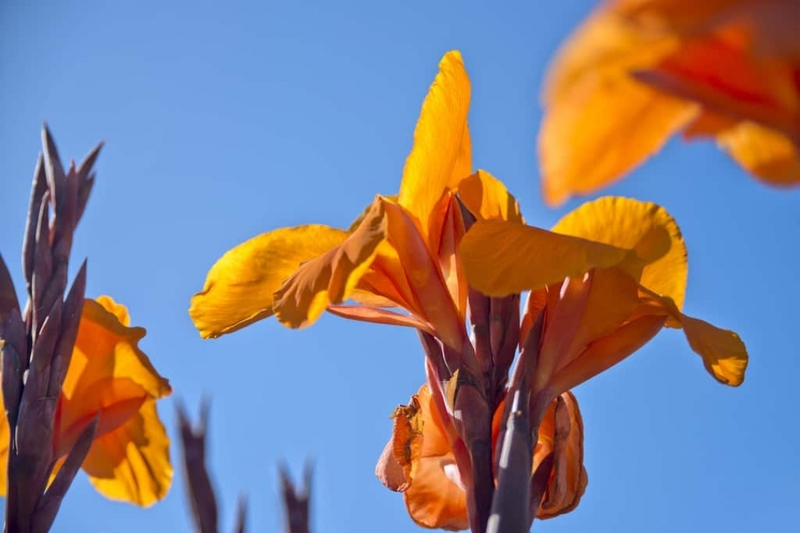 In arid regions, cannas are often grown in the water garden, with the lower inch of pot submerged, and in all areas, high winds tear the leaves, so shelter is advised. The rhizomes are sensitive to frost and will rot if left unprotected in freezing conditions. In areas with winter temperatures below −10 °C (14 °F) in the winter, the rhizomes can be dug up before freezing and stored above 7 °C or 45 °F for replanting in the spring, or they should be protected by a thick layer of mulch over winter. Two solutions: - Either you plant cannas in pots in a mixture of peat soil. This requires a container of at least 20 liters per. Place the pot in the "not too hot" summer light. - Or you plant them in the ground, knowing you will have to come out every year to unroot your cannas to shelter during the harsh winters. A rich ordinary earth is suitable, in the sun or in partial shade. After planting, water copiously! Get your cannas back inside in October-November. If they are in open soil, dig them up with a pitchfork and store them in dry sand. Do not forget to take out your cannas from May! - If they are in pots, easy, just put them in a moderately sunny location. - If you have dug up the rhizomes, transplant them in the garden at 15-20 cm depth every 50 cm, in the light. Every 2 years at the end of winter, repot your cannas! Scratch the outside of the mound and replace some of the substrate thus removed with potting soil. If you have compost, use the juice to fertilize potted plants every two weeks. If you prefer chemical fertilizers, in summer pour every 2 weeks a liquid fertilizer for green plants. You can also include in the soil mix a slow-release fertilizer in the form of small balls during repotting. Forget any input in the fall. Inside, check for red spiders: to get rid of them, clean the leaves with water. Outside, slugs and caterpillars can feast on large cannas. The cannas are solid, most of the time they will survive these attacks, you can let the predators of these parasites manage their proliferation.